Trees that grow in evergreen broad-leaved forests have shiny leaves. 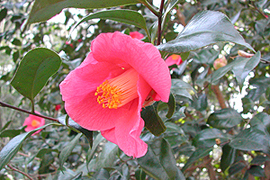 This section features coastal forests of Camellia japonica, Castanopsis sieboldii, and Machilus thunbergii; and inland forests of Quercus glauca, Quercus myrsinaefolia and Quercus acuta. Ardisia crenata and ferns such as Arachniodes aristata and Polystichum polyblepharum make up the herbaceous layer of the coastal forests, while Polystichum longifrons, Cephalanthera falcata and Cephalanthera longibracteata can be seen on the floor of the inland forests. An ornithophilous flower that is pollinated by birds such as the Japanese White-eye. Blooms between February and March. Temperate coniferous forests are mainly comprised of fir, hemlock, hinoki cypress and cedar trees, and are found in humid regions at altitudes of 500-1,000 meters above sea level. 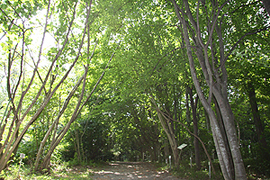 The forest floor is usually dark, but where the light intensity has locally increased around a fallen tree caused by a typhoon or other factors, flowers such as azaleas bloom. Therefore, enhancing the biodiversity of the forest. 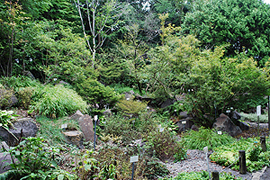 You can see different varieties of coniferous trees, as well as flowers such as Cypripedium japonicum in this section. 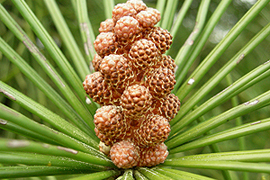 A coniferous species, Sciadopitys verticillata, native to the Kii Peninsula and the Shikoku region, is endemic to Japan and it is the sole species of the family Sciadopityaceae. Sciadopitys verticillata is indigenous to Japan, and only one species belonging to a single genus exists. 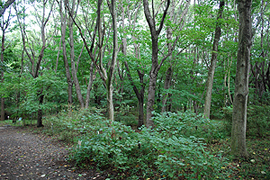 Warm-temperate deciduous broad-leaved forest scenery is typical in rural Japan. The seeds of such trees germinate easily, and lead to rapid forest regeneration where evergreen trees have been cut. Therefore these trees have been useful as fuel resources. 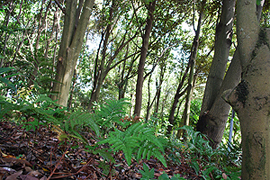 Typically, structured vegetation have developed with, for example, Celtis sinensis, Quercus acutissima, Quercus serrata, and Prunus jamasakura in the tree layer; Callicarpa japonica, Viburnum dilatatum, and Clethra barbinervis in the understory; and Erythronium japonicum and Anemone flaccida in the herbaceous layer. 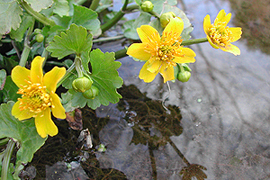 Sunlight filters down to the forest floor in the spring, and characteristic plants including so-called "spring ephemerals" can be seen in bloom. 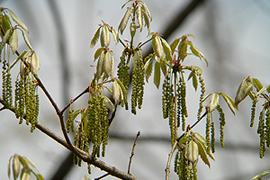 The drooping parts are the male inflorescences that disperse large amounts of pollen. 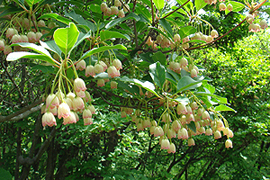 Cool-temperate deciduous broad-leaved forests are found, for example, on the mountains in the Chubu region of Japan (called the Fagus crenata zone), at an altitude of 800-1,600 meters. 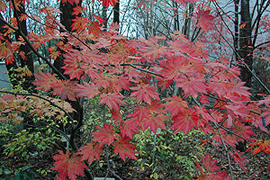 The tree layer comprises of deciduous trees such as Fagus crenata, Fagus japonica, Quercus crispula, and various maple species. The forest floor is bright enabling azaleas to grow in the understory, and an herbaceous layer that is rich in plant diversity. There is a small stream toward the inner part where you can see several endemic plants of Japan such as Anemonopsis macrophylla and Ranzania japonica that favor cool and moist environment. Scrub forests are found in the sunny verge of forest, rocky and wind-beaten areas ranging from warm-temperate (low altitude areas) to cool-temperate (high altitude areas) zones, and also in areas where forests have been cleared. 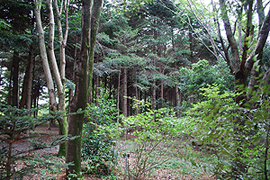 Most plants in scrub forests are insect-pollinated (entomophilous), while in stable climax forests, the dominant trees such as beeches, oaks, and coinifers are mainly wind-pollinated (anemophilous). Plants in this section include Stephanandra incise, an endemic species from the fossa magna region around Mt. Fuji. This species is considered to be derived from Stephanandra tanakae, a species grows over a wide area. 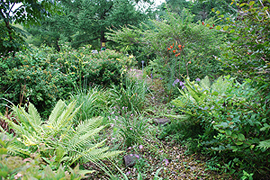 Plants in this section include shrubs that grow close to the earth's surface, such as Vitex rotundifolia from the south of Japan, and Rosa rugosa from the north in the area simulating sandy beaches; plants such as Potentilla chinensis in the area simulating river beds; and willow trees simulating a forest on the riverfront. Parts of this section have also been dedicated to endangered plant species that grow along rivers, and ferns such as Cyrtomium falcatum that are found in coastal areas. Mountain grasslands are found in wind-beaten areas, arid volcanic areas, deforested areas, and grazing pastures in regions ranging from warm-temperate (low altitude areas) to cool-temperate (highland areas) zones. Pulsatilla cernua, Primula sieboldii (primrose) and other endangered varieties are among the plants that grow here. 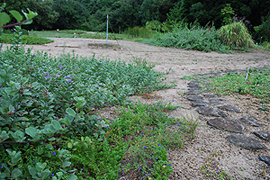 In the low altitude area, autumnal herbs such as Lespedeza bicolor, Platycodon grandiflorus and Patrinia scabiosaefolia grow in fields of Miscanthus sinensis. The Japanese archipelago is covered by many steep mountains. 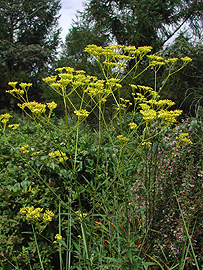 There are many rocky areas in the country, as seen in coastal cliffs, banks of mountain streams, landslide scars of subalpine belts, and marginally forested areas, that are home to many unique plants. The plants grow with their roots attached firmly to the rocks. 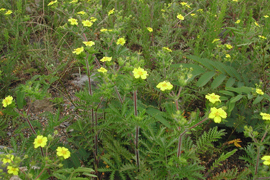 Although they are small in size, most of these plants produce distinctive flowers. 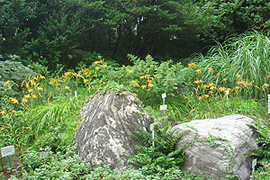 In the area simulating a rocky seacoast numerous autumnal flowers bloom, including Hemerocallis fulva var. littorea and Nipponanthemum nipponicum. 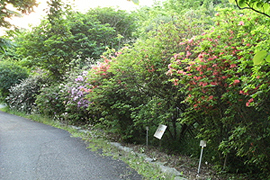 In the mountainous area, one can enjoy seasonal flowers such as Shibateranthis pinnatifida in February, Rosa hirtula in May, and Thymus quinquecostatus in the summer. This section features plants that grow in natural aquatic environments. 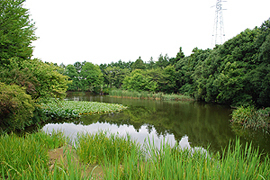 Various aquatic plants are cultivated in the five zones : swamp forest in the mountain (Japanese primrose), marsh in the highland (Water shield), paddy field and reservoir pond (Japanese water clover), marsh in the lowland (Floating heart), and swamp in the alpine region (Japanese water lily).